"There is never a decay of organized religion. When one church falls, another is built. During the 20th century, the new church was Science - in particular, Medical Science. It was constructed to extract the maximum amount of compliance from the population. This is what all orthodox churches do. 'Follow our orders. We know the truth and we are giving it you for your own good; we love you and care about you, unless you rebel; then we consign you to Hell'." Globalism is the New World Order. There is no mystery about it. The alliance between mega-corporations, banks, and governments is ever-growing, as they extend their power over populations. The medical cartel is "a compliance arm" of the New World Order. expand the degree of citizen-obedience in one area, and you expand it in all areas. You create the core habit of obedience. That habit extends down into the subconscious mind. Globalism and the New World Order need that obedience, because its methods are often so outrageous only robots would fall into line. When ratified by 12 nations (Australia, Brunei, Canada, Chile, Japan, Malaysia, Mexico, New Zealand, Peru, Singapore, the United States and Vietnam), it will establish the right of corporations to bypass national courts and demand that their products be sold, without tariffs, without concern for workers who are paid slave wages, without concern for poisoning the environment with toxic chemicals. This, as well as the TTIP, is a secret treaty. In Australia, it will be signed by the cabinet before any supporting legislation is considered. 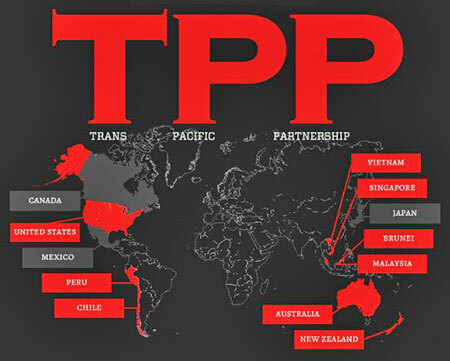 "It [the TPP] has over 20 chapters which include everything from labour and the environment, to intellectual property and telecommunications. The negotiations have been kept secret even from our own Parliamentarians and Senators, but from leaked drafts of the TPP text, we know that there is legitimate reason for concern." Did you catch that last part? Australia's own elected legislators haven't read the treaty. They're not permitted to. In the US, legislators have only had access to limited sections. A secret treaty deeply affecting the lives of all people in those 12 countries, and only a chosen few know exactly what's in it. "You're going to ratify a secret treaty that will put us further under the gun of mega-corporations? Not on your life." Since 1988, when I wrote my first book, AIDS INC., I warned about medical covert ops. To place every person on the planet into a cradle-to-grave system of diagnosing and drugging. To make every person, first and foremost, a medical patient. To thereby condition every person to obey orders. Just do what he tells you to do. From now until they lower your body into the ground. Take the drugs, and become more debilitated and, therefore, more obedient at a much deeper level. This is the foremost system of eliciting obedience in the world. We've recently seen the Australian Prime Minister, Tony Abbott, issue a dictum about vaccination. Former exemptions have been canceled. Families receiving government aid will be cut off from that money if they refuse to vaccinate their children. It's no accident that, historically, the one family most responsible for the emergence of modern medicine AND the Globalist agenda is: Rockefeller. Whatever else it is, the system of modern medicine is a mind-control operation designed to create slavish attachment on the part of the patient. Attachment to the authority of the doctor and whatever he commands. Attachment to the toxic drugs he prescribes. Attachment to the disease-labels he pronounces. In these and other respects, modern medicine is a secular Church, and the doctors are the priests in white coats. They are everywhere in contemporary societies. They rule. They subject the parishioners (patients) to arbitrary fiats. The result of this long-term conditioning: the patients develop a deep habit of loyalty to authority. This habit spreads like ink on a blotter. It begins to apply to all areas of life. "Look, we're going to sign a treaty, and you won't know what's in it. You'll be completely in the dark. But it's a good thing. It's for the benefit of all. Don't ask us to disclose the details. Would you ask your doctor to explain, in detail, the pictures he took of your brain? Of course not. It's beyond you. You're not equipped to understand. Well, in this treaty, which runs thousands of pages, you're not equipped to understand the complex economic details, either. But you can rest secure in your (hypnotic) faith that we're on your side. We want what's best for you…"
"Nine out of ten of my patients walk through the door already convinced that I'm doing some form of medicine. That's what they want. They want me to tell them what to do, while they're awake and while they're in a trance. They're looking for another doctor. Our whole civilization is under a white-coat trance. It took me several years to get over my astonishment at this fact. This is mass-hypnosis on a grand scale." If you're on the side of freedom, you need to look at a whole society and figure out where the deepest form of conditioning is coming from. You need to find out where the most successful form of hypnosis is coming from. Because that's where overall mind-control is strongest. In modern society, it's doctors. This is why governments ally themselves with doctors. It's a perfect partnership. Someday, we could see a President in a white coat with a stethoscope around his neck and a syringe in his hand. He'll be able to tell people the sky is the ground and stars are traffic lights, and he'll be believed. The doctor is the trigger-man for the New World. Maintaining the freedom to refuse medical care is imperative. The Holy Church of Medicine and its allies and dupes are out in full force these days. They want compliant slaves.